Pancakes? Healthy? Super low calorie? Whaaaaaat?? Gimme gimme. Guys, if you didn’t know already, I’m a HUGE sucker for anything sweet, like honestly…I know that everyone talks about having a “sweet tooth” but I’m convinced that I have more than that. We’re talking sweet bottom row of teeth, maybe even some at the top too. Chocolates? Mine. Candy? Mine. Cheesecake? NOM. Speaking of cheesecake, I’m one to openly admit that I may have fallen subject to eating a giant slice of leftover Cheesecake Factory cheesecake for breakfast once or twice. I know, I know, I’m awful!! But I’m constantly working out ways that I can get my morning sweet fix in a healthier way. I think I definitely hit the jackpot with this one. Skinny Banana Blueberry Pancakes …. slurrrrrrp. These pancakes are naturally sweetened with banana so there are no worries about any added refined sugars. What’s even better? They’re super duper easy to make. I’m talking practically effortless. No mixer needed, no large bowl, no fancy schmancy pancake pourer gadget thingy. Nope. Guys, we’re keeping it as simple as can be because this is a morning meal and let’s face it, every minute counts when you’re ravenous after a sleep coma and have pancakes on your mind. Banana, oats, egg whites, Greek yog, chia seeds, blender, GO. Just pour onto a nonstick skillet straight from the blender spout and throw a few blueberries on top. Ta-da. Told you it was easy. One of the great things about pancakes in general is that there are endless possibilities for what you can use as toppings. Let your imagination wander my friends. For these, I kept it relatively close to home: a few sliced bananas, a dollop of Greek yogurt and my all time fav Low Calorie Peanut Butter Topping. Add all ingredients, except blueberries into a blender and blend until no lumps remain. Turn stove onto medium heat and spray non-stick skillet with cooking spray. Pour pancake batter in small-medium sized portions. Add a few blueberries to each pancake and allow to cook thoroughly on one side until golden brown. Pancakes should be easy to flip which will indicate that one side is cooked. Flip carefully and cook on the other side. Batter should make enough for 6-8 small-medium sized pancakes. mine didn't turn out fluffy, and they burnt on the outside and were mush on the inside.. I even turned down the heat from medium to low for a couple of them. Had to throw the whole batch out :( What am I doing wrong?! Oh no! I'm so sorry to hear that they didn't turn out, Sarah. I found that the key to this is using a very good nonstick skillet. Lowest heat possible and wait until you notice the sides start to brown before attempting to flip. Hope this helps! What great looking pancakes! 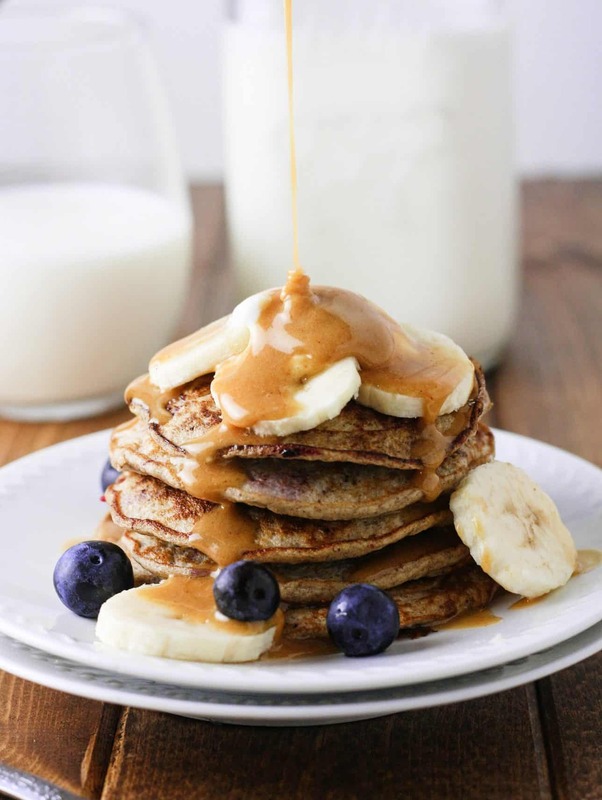 Banana pancakes with peanut butter sauce? Yum. And lots of fiber and protein to keep you full. They kept me satisfied until lunch time which for me (hi, hungry hippo over here) is a BIG DEAL! Nice alternative to heavy pancakes! They look and sounds really delicious! I love pancakes but I've never had made with oats and yogurt before!! It's so easy to make and looks delicious. Super easy, which is why I luuuuuuv them! Wow, these look super good. I must figure out the WW points on these, they look like breakfast this weekend! We are all about the pancakes at the moment and blueberry and banana are one of my favourite combos. You can never go wrong with the banana blueberry duo! These pancakes look amazing! And they won't leave me hangry an hour later? SCORE! That's what I'm saying! It's truly a win, win, Bethany!